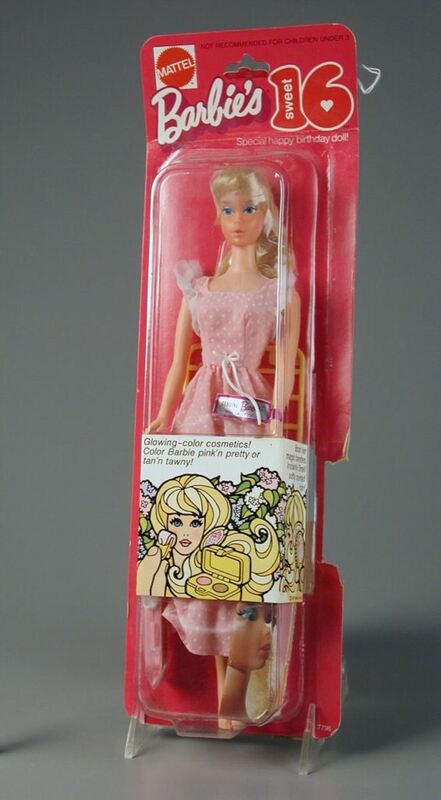 Barbie is an American icon and most girls have at least owned one in their lifetime. Whether you are a Barbie doll collector or purchase the dolls for your daughters, I am sure that you agree that Barbie’s hairstyle can detract from her beauty once removed from the box. What happened! 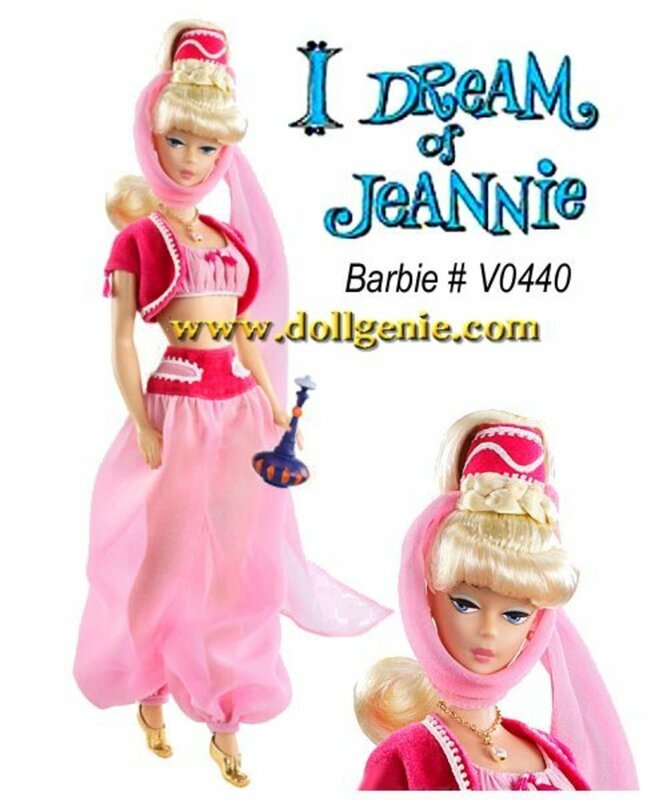 The “must have” doll displayed in the box with the beautiful clothes and accessories is not the same with a hairdo that tumbles into a tangled mess once removed from the box. It is very easy to restore Barbie’s hair. And a doll that is lovingly played with, or sold as a rummage sale item, can become as good as new and proudly displayed in a collection or saved as an heirloom. 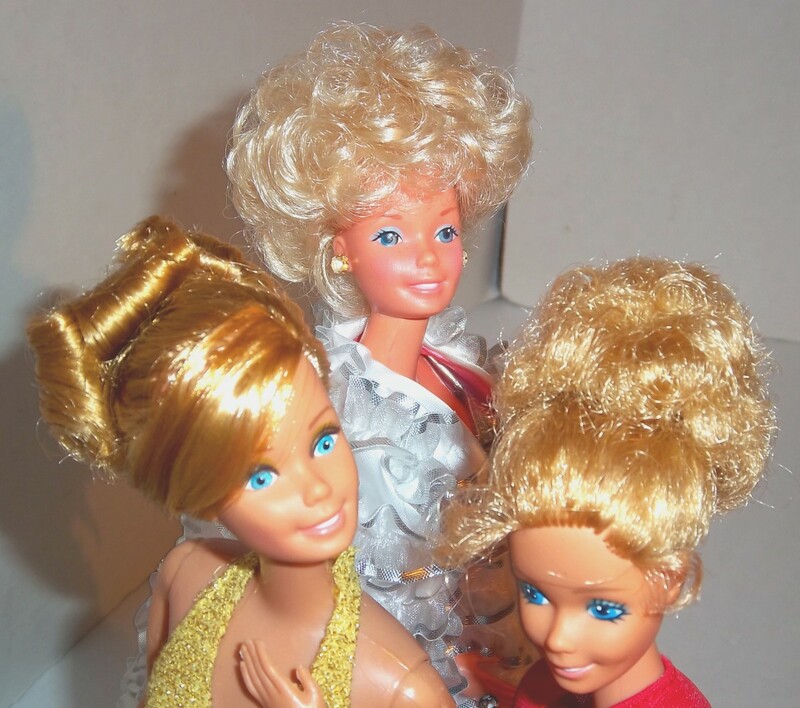 Barbie’s hairstyle can improve or detract from her looks. A simple restyling of her hair can easily be accomplished by anyone. 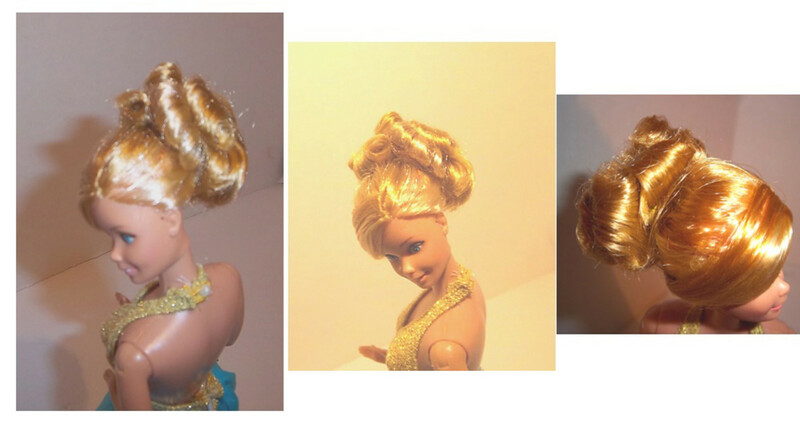 Most Barbie dolls have LONG hair and the easiest way to restyle her hair is by doing a simple updo. Yes, just like her human counterpart, tying her hair into a ponytail is an easy way to improve her looks. However, Barbie’s hair is made from fibers that can easily be shaped into various attractive styles with simple household products. Hair that has a nylon feel to it is the easiest to style and can be cut, shaped, teased, and curled just like human hair. 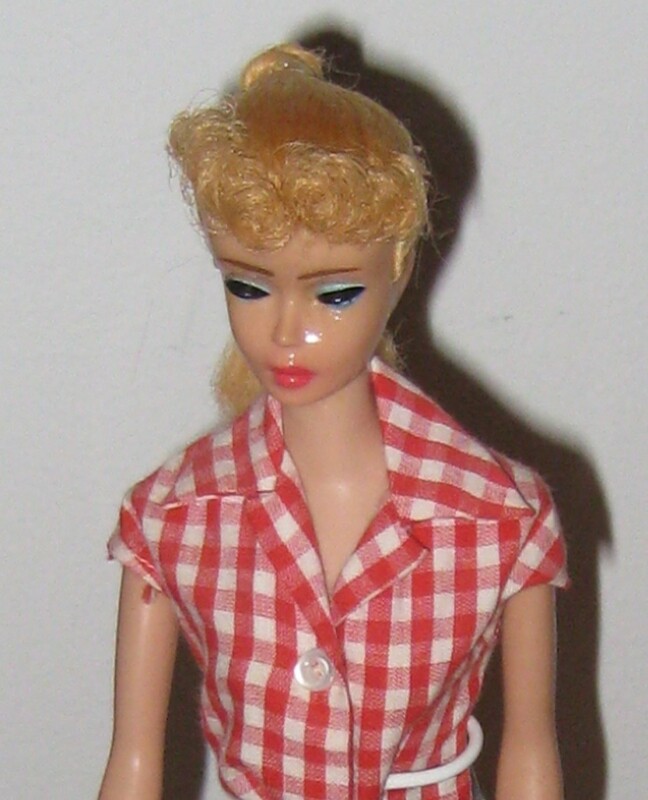 Some Barbie dolls have hair that feels like “fabric” and I would not recommend working with this type of hair. It’s very easy to feel the difference. Let’s get started. The instructions are for a curly updo. Here is a list of items that you will need to get started. 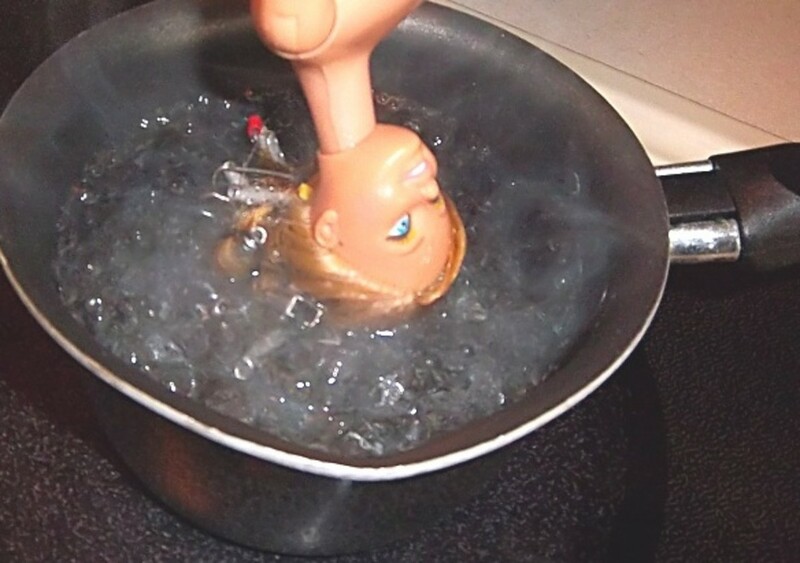 Wash the hair and clean the doll in hot water using dishwashing detergent. This works the best because it removes oils, grease, and dirt, yet is gentle on most hair and plastics. It is important to use HOT water because the heat straightens and removes the hairstyle that has been preset by the factory. Towel dry, comb and cut the hair to an even length. At this time determine if the updo hairstyle will have a banged fringe, a side swept fringe or is combed straight back. 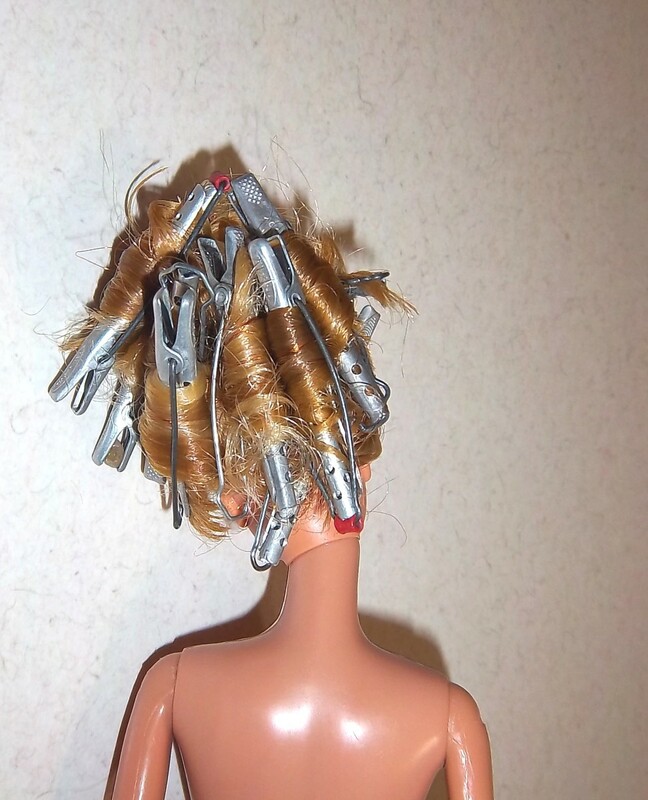 Our style has a side swept bang fringe that is combed and held in place with a rubber band in the back of Barbie’s head. Hair that is combed straight back is the easiest to style. Now that her side swept bang fringe is in place, gather all the hair and fasten with TWO rubber bands. 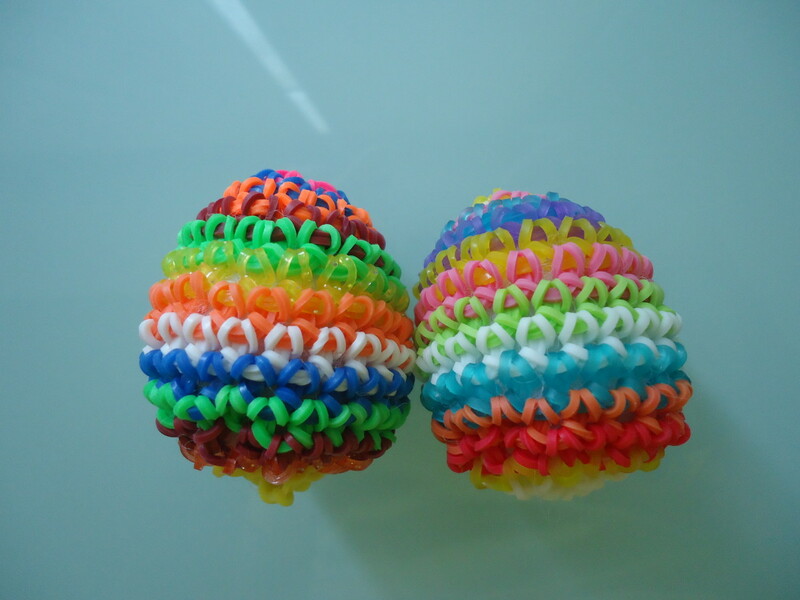 I order my rubber bands from EBAY, but if you have access to orthodontic rubber bands, those will work also. I have found that the dental rubber bands tend to deteriorate over time and snap. And I have gone to a different brand, but either will work. At this point you may want to gently thin the hair with thinning shears. Since Barbie’s hair is synthetic, once gathered, you may have more hair than you need for the hairstyle that you are trying to achieve. Be careful when thinning because once the hair is gone it cannot be replaced. Next use hair rollers (I purchased the small curlers at a flea market) and randomly wind the hair around each. It does not matter where you place the rollers because once dry, each curl will fall into place. It is not an exact science, and “messy chic” tends to look better. Once the whole head is rolled, gently submerse the head in boiling water for a second or two. Immediately thereafter place in ice water. The boiling water curls the hair around the rollers and the ice water sets the curls. This may take some experimenting and that is why I recommend using rummage sale dolls to learn this technique. If submerged too long in the boiling water, the hair disintegrates and leaves you with a frizzy mess. It is similar to a bad perm. Blot dry being careful to keep the hair on the rollers. Air dry the hair and this can take anywhere from 24 hours to several days. It is important that the hair is DRY or else the curls will not set. So be patient. Once the hair has dried remove the rollers and touch up where needed. I have found that snipping a few hairs here and there is all that is needed to achieve a professional hairstyle. Applying a little hairspray all over will hold the updo in place. Be careful to cover the doll’s plastic parts with a paper towel when spraying her hair. 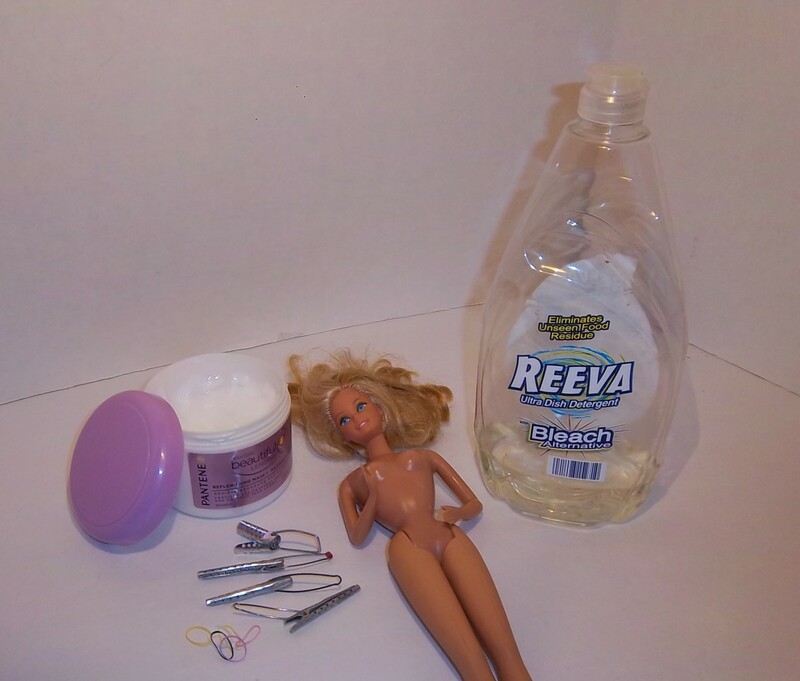 Hairspray is difficult to remove from Barbie dolls and I have yet to find a way to do it successfully. 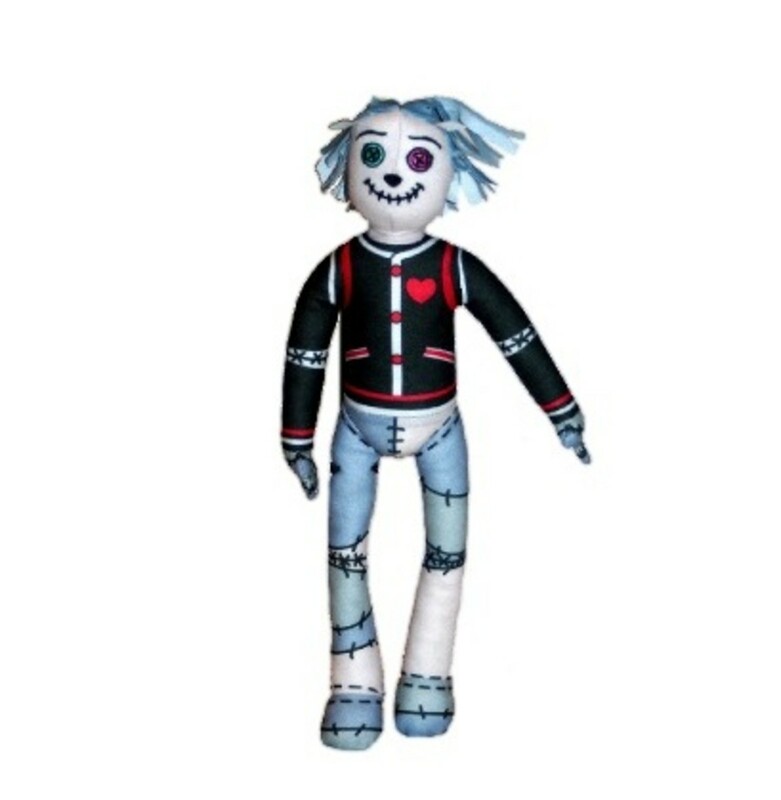 You are now ready to display the doll. Thanks a great idea, thanks so much for the input. soda straws work great for hair rollers. cut into different lengths. Take a piece of small tape and then put another piece of tape over the middle of the sticky end (the width of the bangs). Put this non-sticky end over the bangs and tape the head so NONE of the hair is taped. That will keep the bangs straight while you style the rest of the hair. How do I keep my barbies bangs straight? Thank you, yes the boining water works great to style. 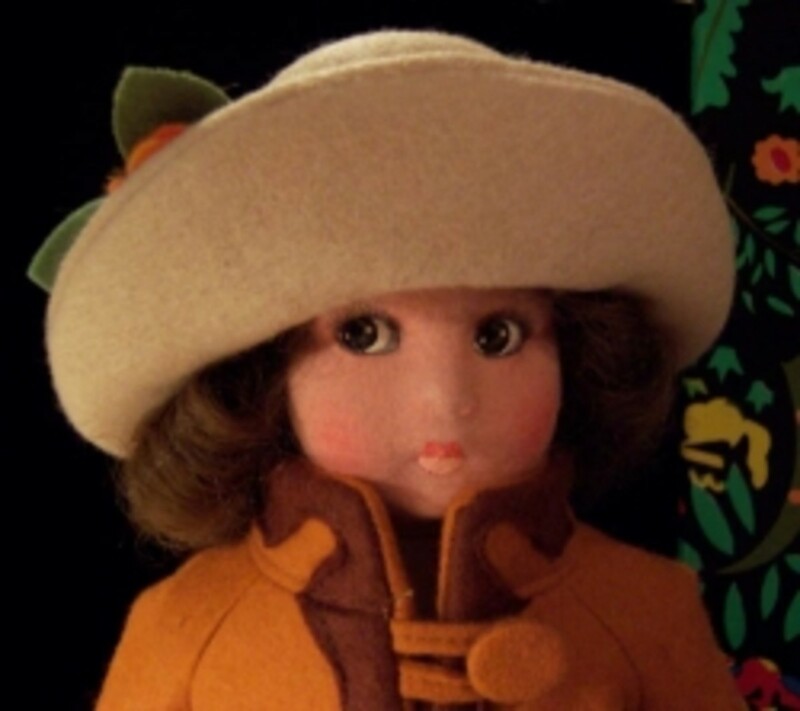 I've done a number of dolls and they all turned out nice but I've never tried a pocelain doll. If the hair is the same on your porcelain doll as the other Barbies, go for it, just be careful of the actual porcelain, I've never tried it on porcelain. I have a porcelain doll and I would love to "correct" her hair. The boiling water I wold have never thought of - thank you! Very well done! Great photos and fantastic ideas! Well I have some dolls well they are kinda.... gross they need THIS BATH! thanks this REALLY helped my dolls get clean! 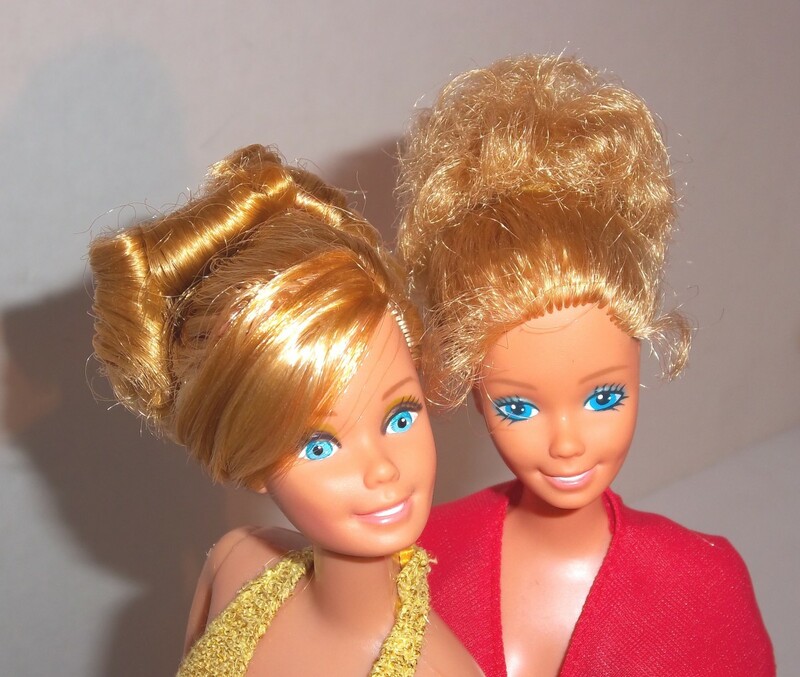 If you restyle a new Barbies' hair it will make it better. I do this all the time with my new dolls too.